If you want to channel the holiday spirit, why not make a Christmas toy solider costume? Toy soldiers are a holiday favorite and blend perfectly with a Nutcracker theme event. Whether you are donning a Sugar Plum fairy at your side or standing tall and stately as a soldier, this costume idea is unique and just plain festive to wear! While there are plenty of variations of a toy soldier, British toy soldiers are the most commonly emulated in a costume form. The well known and sophisticated red and black uniform worn by the British lends a very festive and regal touch to holiday dressing. 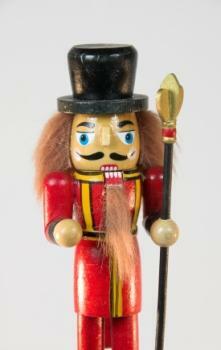 Toy soldiers are highly collectible and are synonymous with the fairy-tale inspired Nutcracker ballet, composed by Tchaikovsky and adapted by Alexandre Dumas in 1891-1892. The beloved ballet adored by children and adults alike is sure to be rekindled when you make a Christmas toy soldier costume. The military jacket is the most important aspect besides the hat for creating a toy soldier costume. You can shop resale boutiques, or check with your local high school band department to see if they have a red or royal colored jacket available for lending. To save a few pennies, you may even consider checking with a local theatre department to see if they have a costume available for rent. A military jacket can be worn over a lightweight t-shirt for added comfort. No soldier costume would be complete without a wintry, tall and narrow black furry busby hat. This unique adornment worn by British soldiers may be the hardest element of your costume to track down. You can shop the Internet for millinery sites that sell this infamous hat style, or even construct your own with a bit of black faux fur. You'll need a pair of white gloves to add a touch of dapper sophistication to your suit. Make sure they are fitted and bright white. In the event your military inspired jacket lacks gold buttons, you'll want to have a needle and thread handy to affix a few stately charms to your jacket. Three or four buttons running the length of the jacket should suffice in creating the classic soldier style. Navy or blue dress pants will be the final fabric necessity of your costume creation. While simple chinos will suffice, a crease and pleated free pair will look the best. In a bind, you can throw on a pair of black or navy sweatpants or leggings if needed. Black boots are the preferred footwear for a soldier costume. While ankle or mid-calf boots are acceptable, knee high patent boots are the best choice. Lace up boots will add an even more authentic military appeal to your suit. While the basis of a toy soldier costume is relatively easy, some aspects of the wardrobe will inevitably prove challenging to find. Keep an open mind and be ready to make any substitutions that are needed. For example, a tall black pair of socks worn to the knee can act in for a pair of boots. A black fur muffler affixed to the head will emulate the look of a busby hat. No matter how your costume comes together, the most important aspect of your soldier uniform is confidence! While you should always stand tall and stately, remember that toy soldiers are allowed to have a little fun!